"Undecimo die Decembris anno regni regis Ricardi secundi decimo octavo, ducti fuerunt hic coram Johanne Fressh maiore et aldermannis civitatis Londoniensis Johannes Britby de comitate Eboracum et Johannes Rykener, se Elianoram nominans veste muliebri detectus." On December 11th, the Archive -- London Metropolitan Archives, Plea and Memoranda Roll A34, m.2 -- was present and witness to the turn of events on Cheap Street between John Britby and Eleanor Rykener, recording their confessions and the interpretations of these confessions by the scribe. In the previous sections, the Archive has been taken as an extension of the scribe's view of the events. But the Archive is also our only record of Britby's view of events. And likewise, the text is also our record of Rykener's view of events. Thus while the scribe put ink to paper, the authorship of the Archive is a collaborative work with words, perspectives, and narratives being contributed by multiple persons. Because it is an assemblage of multiple co-authors, the Archive is not identical to any one view of Eleanor Rykener or her story. As such, the Archive is worth considering in and of itself as evidencing the dysphoria in the archive of Eleanor Rykener and the wider dysphoria in the medieval archive which has been compounded by the Cisgender Turn and which the Transgender Turn seeks to answer. What does it mean that the Archive, Plea and Memoranda Roll A34 m.2, is a dysphoric Archive? The short definition of dysphoria provided by the Diagnostic and Statistical Manual of Mental Disorders, Fifth Edition (DSM-5) attests that gender dysphoria occurs when one's gender identity or expression conflicts with the gender assigned by society, for a period of at least six months. The longer diagnostic definition also acknowledges the present of a disgust for certain forms of gender and an overwhelming desire for another form of gender. In both these respects, the Archive, A34 m.2, both reflects dysphoria, embodies dysphoria, and creates dysphoria. In the first case, the Archive reflects the dysphoria in the courtroom. The central question of the interrogation seems to be whether or not Rykener is a woman, Eleanor (according with her expressed and identified gender), or a man (according with the assigned gender given by the court and other parts of her history as "John"). The courtroom reflects the textbook circumstances of dysphoria. Furthermore, I would argue that the Archive, A34 m.2, does indeed have three co-authors, Eleanor Rykener, John Britby, and the scribe. Because the Archive is the composite perspectives of all three regarding Rykener's gender, the Archive itself embodies this dysphoria of self and society, identity and expression versus social assignment. The Archive also seems to embody the tensions, disgust, and desires of all three. The Archive records that Rykener calls herself Eleanor, yet repeatedly calls her John nonetheless, yet uses Latin to carefully avoid using gendered pronouns. The Archive embodies the disgust for and desire for different genders. Finally, as seen in the consideration of the Scribe as the perspective which greatly informs the Cisgender Turn on Eleanor Rykener, the Archive is also the grounds on which a Transgender Turn may arise as well. What do we do with dysphoria? 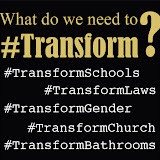 This is a foundational question that the Transgender Turn seeks to answer on the individual and systematic scales. Faced with evident dysphoria, the cisgender turn may very well throw up its hands with frustration or joy. Unspeakable! Ambiguous! Queer! Yet following the lead of Eleanor Rykener's turn, a transgender turn on the Archive, A34 m.2, might likewise seek to alleviate dysphoria by transitioning discourses. This means changing some of the ways that we discuss the Archive, for instance the names and pronouns that we use, but does not necessarily mean that problematic or messy parts of history are merely erased. Granted, some forms of transition use the formulation of absolute change as describe by Carolyn Walker Bynum in Metamorphosis and Identity, wherein the past and future are divided absolutely at the point of change. 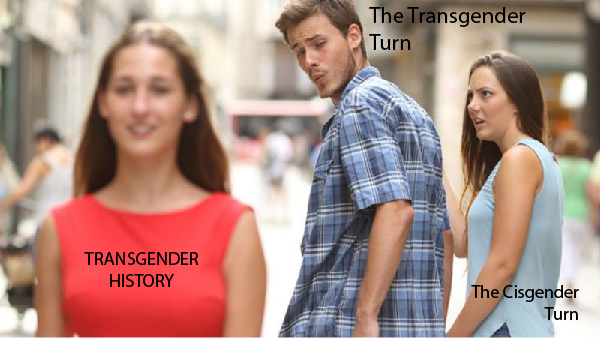 Yet this is not the only or perhaps the most ethical form of trans history. As Sandy Stone writes, "transsexuals must take responsibility for all of their history" (Stone 49). So must the Transgender Turn. Yet how do we move forward without erasing the past? How do we synthesize the old turn and the new turn? Once again, Rykener's leads the way by epitomizing a Transgender Turn based on consent, payment for labor and a privileging of the transitioning identity. Despite the cisgender turns' ignorance and compounding of the problem, the dysphoria of the Archive can follow the transgender turn toward transitioning by ethically engaging it within the terms it sets for consensual use. While the dysphoric archive contains the stories of multiple persons, cisgender and transgender, only the consent of the cis persons has thus far been affirmed by later historians. Although certainly coerced into telling his story by the courts, John Britby consents to tell his story within the persona of John Britby. Because this name and identity seems to match his given name and identity, defining him as cisgender, the scribe and historians affirm both by telling the story of John Britby as John Britby's story. The power to tell one's story and one's name may be considered perfunctory by some, yet the fact that it can occur without remark points to an element of cisgender privilege perpetuated by the cisgender turn. Britby consents to tell his story in a certain way and that certain was is respected. We see how remarkable this consensual exchange between storyteller, scribe, and historian is when we consider the case within the same archive wherein the grounds for consent are not honored. Like the cisgender man, the transgender woman, Eleanor Rykener, is also asked to give her name and story to the court. The name she gives the court is Eleanor. The story she tells is Eleanor's story, mostly concerning her life as Eleanor. These are the grounds for her consent, that she will tell her story but she will tell her story her way: as Eleanor. Yet the scribe and the cisgender turn on the archive do not honor the conditions of this consent. The scribe and cisgender turn uses Rykener's story but remove or side-line Eleanor from it. Instead, the scribe and cisgender turn calls her John, her deadname. Throughout the archive, the scribe calls her John. The cisgender turn follows suit. Alternatively, some in the cisgender turn force Eleanor on the same level as John, describing her as John/Eleanor. Even as Eleanor is placed alongside John, however, she is placed second. As ever, the supposed cisgender persons gets their turn first and the transgender turn comes second. Yet Rykener did not consent to tell her story as "John" or as "John/Eleanor." She consented to tell her story as "Eleanor." The story is thus the story of Eleanor Rykener, wherein John is a footnote. Thus the dysphoria arises from the lack of honoring the conditions for consent. Thus the demand of the transgender turn to transition how scholars approach the archive, to diminish the dypshoria, to eschew the deadname in favor of Rykener's self-identification, and to honor the grounds for a consensual telling of her story. Before she would consent, Eleanor Rykener demanded to be paid. The demand for transgender persons to be paid for their labor goes hand in hand with Rykener's conditions for consensual relations between the trans body, the trans story, and those who would use them. Yet how should Rykener be paid for her story? No longer living nor with identifiable ancestors, such payment cannot be monetary in the same form as an author might receive from consumers and publishers for sharing her story. Certainly, Rykener was not likely paid by the courts for her story. Indeed, she may have been punished instead. Yet to merely follow the medieval court's treatment of Rykener should not be the motto of the transgender turn toward the archive. Rather, we should consider how else we might honor Rykener's insistence that trans lives be compensated for their labor and use. At this point, another option arises from elsewhere in medieval scholarship: citation. Why should we not consider Eleanor Rykener an author of her own story? Critics might respond that Rykener did not write down her story, that the writer of the Archive is the scribe. Yet other cisgender medieval cisgender storytellers likewise utilize scribes, indeed they may even had been illiterate, and we still give them the honor of citing them as authors. The Book of Margery Kempe is one such example. The Book boasts of using a scribe, multiple scribes, yet scholarship still has adopted the tradition of calling the Book her book, the Book of Margery Kempe. Shall we deny Rykener, another medieval woman who may likewise have been illiterate and therefore dependent on another man to scribe her story? Now, one might respond that Kempe had more control and intention in composing her book than Rykener does over her story. Yet this merely extends the prejudice for literate male authors, or cisgender authors, to include a prejudice for authors of a class and wealth to claim control over their words. Kempe likewise found herself before courts and in prison, yet she had money to tell her side of the story and to preserve it in a book. For all the payment she received in exchange for her sexual consent from the Britby's of her city, Rykener does not have the class nor money nor cis male identity to purchase control over her words. Thus taken from her by coercion, Rykener's story is taken, used, copied, and retold within the cisgender turn without ever paying the author back. This injustice and break from Rykener's conditions for consent might likewise be rectified by another transition in scholarship: naming Eleanor Rykener as an author of her story. Or, at very least, she should by listed as a co-author alongside John Britby who likewise tells part of Rykener's story. 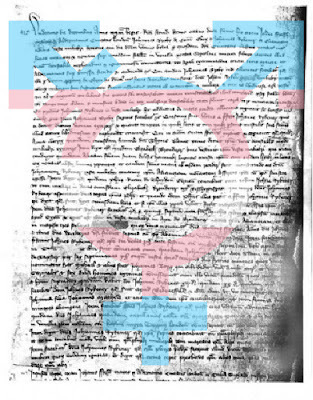 Only by paying Rykener through citation and a byline can the transgender turn establish and maintain a commitment that is as important for medieval trans lives as modern trans lives: if you wish to use trans stories and trans bodies, you should pay trans subjects, at very least give them the credit of authorship over their own lives, bodies, names, and stories. John – Eleanor is a coproduction by TEHDAS Theatre and puppet theatre HOX Company. It was also part of the Turku European Capital of Culture 2011 official program. It has been touring in England, Italy, France and USA after the premiere.